“I rewrote the first chapter so many times,” said Fanson. “I didn’t know where I wanted to start.” Fanson also rewrote the book several times. First telling the story from the perspective of her father, who was three at the time of his father’s passing. She settled on a third person account with her grandmother, Janetta as the main character. 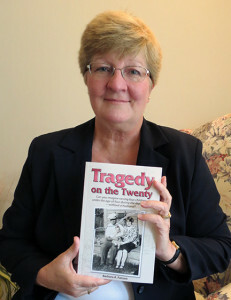 Copies of Tragedy on the Twenty can be purchased at one of her presentations or this website.